Expanded drilling activity in the SCOOP (South Central Oklahoma Oil Province) is providing many new economic opportunities for owners of mineral rights. These opportunities include mineral resources in South Central Oklahoma on lands that were once allotted to members of the Choctaw and Chickasaw Nations, two of the tribes forcibly removed to Indian Territory in the 1830s prior to Oklahoma statehood. It is very common for real property in South Central Oklahoma to include in its chain of title real property interests that are restricted Indian interests, or interests that are held in trust by the United States for a tribe or an individual tribal member. If those interests have been sold, leased, encumbered, or otherwise conveyed in violation of federal law, those conveyances could be rendered null and void by federal law, resulting in a cloud on title for subsequent successors in interest in the chain of title. Consequently, it is crucial for royalty owners, lessees, and parties to any transaction involving lands in the SCOOP play to be aware that their property interests could be affected by an enormous body of federal and tribal treaties, statutes, and regulations governing the acquisition, inheritance, devise, and transfer of trust and restricted Indian lands. One of these statutes in particular – known as the Stigler Act – affects conveyances of restricted Indian interests owned by members of the Oklahoma Five Tribes, and the Act may soon be amended by a bill recently introduced in the United States House of Representatives. 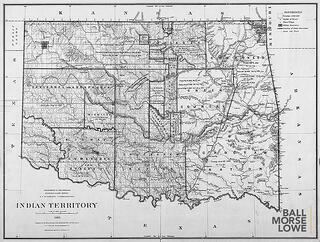 Of the five hundred and sixty-six federally recognized tribes located within the geographical boundaries of the United States of America, as of today, thirty-nine of those tribes are located within the geographical boundaries of the State of Oklahoma. Each one of these tribes is a separate sovereign government with a unique body of law applicable to real property rights of tribes and tribal members. Like tribes in other states, the lands of most of these tribes were allotted to their individual tribal members under the General Allotment Act (also known as the Dawes Act of 1887). However, due to provisions of certain treaties between the United States and certain tribes, six of these tribes were specifically excepted from the Dawes Act, and became the subject of separate allotment acts by Congress. One of these tribes – the Osage Nation - was allotted under the Osage Act of 1906. The Five Tribes (the Chickasaw Nation, the Choctaw Nation of Oklahoma, the Cherokee Nation, the Muscogee (Creek) Nation, and the Seminole Nation of Oklahoma), which were formerly known as the “Five Civilized Tribes,” were allotted under the Act of June 28, 1898 (also known as the Curtis Act), which extended provisions of Dawes Act of 1887 to include the Five Tribes in the allotment scheme. The Act included provisions that imposed specific restrictions on conveyances of allotments by the allottees, which meant that sales, leases, or other encumbrances of allotted lands were null and void as a matter of law. The Act also made the allotted lands non-taxable. Although the restricted status of the lands was initially limited to a fixed period of time (twenty-one years), a series of subsequent congressional statutes extended the period of restrictions on alienation not just for the life of the allottee, but for the allottee’s heirs and devisees who inherited interests in the allotment. The Act of August 4, 1947 (61 Stat. 731) (commonly known as the Stigler Act) automatically removes restrictions on alienation of allotted lands inherited by members of the Five Tribes who have a blood quantum of less than one-half (1/2) Indian blood (as determined by the relationship of the heir or devisee to their ancestor on the Dawes rolls), effective upon the date of death of the decedent. For members of the Five Tribes with a blood quantum of one-half or more, a sale or lease of restricted mineral interests requires approval of an Oklahoma district court. For tribal members of less than one-half blood, automatic removal of restrictions means that the lands they inherit also loses its tax-exempt status. For the Five Tribes, automatic removal of restrictions results in large amounts of property being removed from tribal jurisdiction and federal protection. Consequently, for several years, governments of the Five Tribes have lobbied for legislation to limit the automatic removal of restrictions. Recently, United States Congressman Tom Cole (OK-4), a member of Chickasaw Nation of Oklahoma, along with co-sponsors, Congressmen Markwayne Mullin (OK-2), Frank Lucas (OK-3), and Steve Russell (OK-5), introduced legislation to address the concerns of some of their tribal constituents. The restricted interest of the decedent was “[c]onveyed by the decedent’s undetermined heirs or devisees of less than one-half degree of Indian blood with or without Oklahoma district court approval. What could this mean for Indian descendants who inherit restricted interests in Five Tribes allotments? Descendants with a blood quantum of one-half or more would likely remain unaffected, as conveyances of restricted interests already require approval of an Oklahoma district court judge, and will continue to do so. However, if these amendments are signed into law, descendants with a blood quantum of less than one-half blood who desire to sell or lease their inherited interest, will be unable to do so without approval of an Oklahoma district court judge. At this stage, it is difficult to predict whether or not H.R. 2606 can obtain the necessary support to pass both chambers of Congress and be signed into law. Previous attempts to amend the Stigler Act have been unsuccessful. For example, in 2000, the “Five Nations Citizens Land Reform Act of 2000” introduced in the House as H.R. 5308 and the Senate as S. 3182 did not survive the 106th Congress. However, those bills proposed far more sweeping changes to the Stigler Act than H.R. 2606. Nevertheless, if you are a descendant of a Five Tribes allottee, and you are interested in selling or leasing an interest in restricted Indian lands, you should keep a close eye on the progress of H.R. 2606. If enacted, these proposed amendments to the Stigler Act would result in the most significant changes to law applicable to Five Tribes restricted interests in over seventy years. Because so many lands in Southern Oklahoma, particularly in the SCOOP play, are rooted in Indian titles involving Five Tribes allotments, this change in the law would undoubtedly effect title opinions involving restricted property interests in Five Tribes allotments. H.R. 2606 Hearing Memorandum for October 2, 2017 hearing before the Subcommittee on Indian Insular and Alaska Native Affairs. If you need title work for real property involving interests in Indian lands, Ball Morse Lowe has a team of title attorneys with the expertise in Indian land titles you need. Give our offices a call today at 405.701.5355.